The Mustang Heritage Foundation is doing what no other horse related organization in the nation has attempted – give a horse to a trainer for 90 days and guarantee $700 in payment, with the promise to help market the trainer and the horse to the public. Colbert added that the $700 creates a trickle down economic effect throughout the agriculture market through the continued purchase of grain, hay and horse care products. Monett, Mo., horseman Chad Kelly has reaped the benefits of being involved with the program. Since becoming a TIP trainer in 2008, Kelly has placed more than 40 mustangs for adoption throughout Missouri and the Midwest and has earned more than $50,000 in TIP incentive funds. 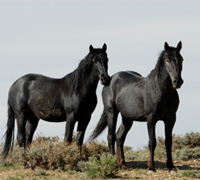 In order to qualify, certain criteria must be met to satisfy Bureau of Land Management (BLM) regulations, which is responsible for the management of more than 30,000 wild horses roaming public lands. Mustangs are periodically gathered and removed from herd management areas (HMAs) and are placed for adoption across the country. The most vital of criteria, among others, are that TIP trainers must be at least 18 years, must have a track record of using natural horsemanship training methods, have facilities that meet BLM requirements, as well as no history or convictions for abuse of animal. To obtain a full description of the program and to apply, visit mustangheritagefoundation.org. This is a great idea, and I love it. But I’m not sure how well it’ll work, practically speaking. Depending on the time of year and where the trainer is, it may cost the trainer around $100 a month to feed the animal, and then $30 or so for hoof trims at least 2x in those 90 days. And what about vaccinations or any other/additional vet care that may be needed? In short, it may cost the trainer close to $400 to care for the horse in those 90 days, so his net pay for the work may be more like $300, not $700. And even if the MHF eats the $700 a head to pay the trainers, are they really going to be able to sell these horses in a timely manner when mustangs aren’t being adopted at $125 a head as it is, and realistically, most trainers – even good ones – aren’t going to take a horse from untouched and wild to safely started for the average rider in 90 days. A lot of that time is going to be spent getting the horse in good weight, his hooves and teeth done, and getting him used to basic handling (lead, tie, pick up feet, stand for grooming/bathing, etc). 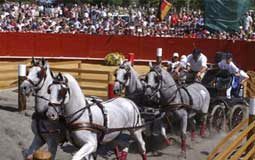 Natural horsemanship or not, it’s a daunting task. Do-able for sure, but even those “mustang challenge” trainers will tell you that 90 days DOES NOT a broke horse make. it’s only a start. And in a down economy, people who ARE interested in buying or adopting a horse are more likely to get a proven, well-broke horse. So while I applaud the Mustang Heritage Foundation for their efforts, I’m not sure how successful this program will be. This sounds like a great idea but $700 isn’t much. I suppose it’s more charity on the part of the horse trainer and a chance for some publicity. Sounds like a great idea. Hope that it works well to save alot of the mustangs. mustangs WILD from the BLM, and trained from “0”. I have JUST adopted a wild one from a TIP trainer. Not only is this little guy sweet, calm and curious, but he even knows what grain and carrots are! It seems to this program places mustangs in private homes, first of all, pays trainers to do their craft secondly, AND gets a decent number of mustangs out of feedlots and out the government’s horse welfare system. It’s probably not the end all, do all answer, but I think it’s a great start. And anyone who has never been to an Extreme Mustang Makeover has an eye-opening experience at the first one:30 days training from zero to lightspeed… Mustangs ROCK!